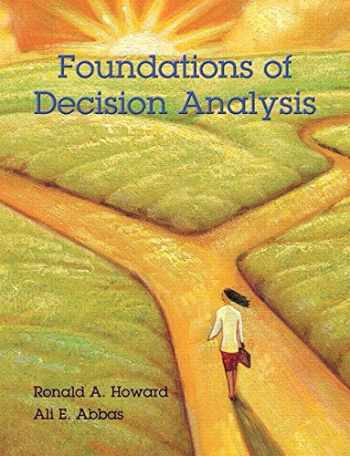 Acknowledged author Ronald A. Howard wrote Foundations of Decision Analysis comprising 720 pages back in 2015. Textbook and etextbook are published under ISBN 0132336243 and 9780132336246. Since then Foundations of Decision Analysis textbook received total rating of 3.5 stars and was available to sell back to BooksRun online for the top buyback price of $58.95 or rent at the marketplace. For courses in Decision Making and Engineering. The Fundamentals of Analyzing and Making Decisions Foundations of Decision Analysis is a groundbreaking text that explores the art of decision making, both in life and in professional settings. By exploring themes such as dealing with uncertainty and understanding the distinction between a decision and its outcome, the First Edition teaches readers to achieve clarity of action in any situation. The book treats decision making as an evolutionary process from a scientific standpoint. Strategic decision-making analysis is presented as a tool to help students understand, discuss, and settle on important life choices. Through this text, readers will understand the specific thought process that occurs behind approaching any decision to make easier and better life choices for themselves.